The April 2017 NAPOLCOM PNP Entrance and Promotional Exams results, conducted by the National Police Commission are released eight (8) weeks after the date of examination. 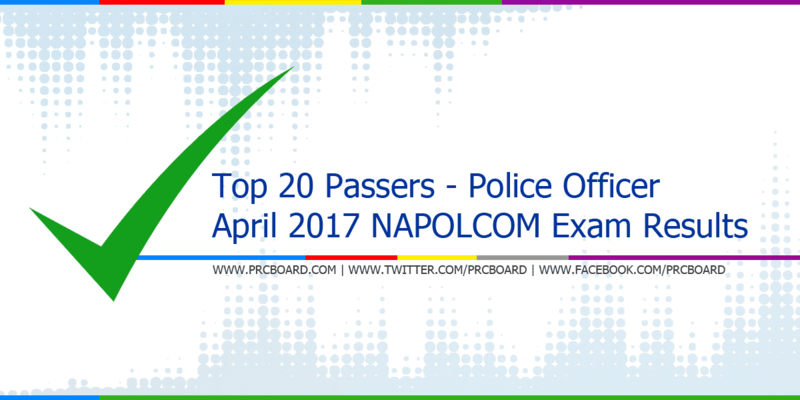 Aside from the official list of passers and related announcements, top 20 passers for Police Officers and other positions are also posted. Below is the list of Police Officer topnotchers issued by the National Police Commission. While most examinees are asking about the possible release date, as mentioned in the main page of this article, it is expected to be out 2-3 months after the last day of exams. Meanwhile, the above-mentioned duration is just target/ estimated timeline, results may be released earlier or later without prior notice. PRCboard.com is among the trusted websites when it comes to providing timely and reliable information in any board, promotional or eligibility examinations conducted by PRC, NAPOLCOM, CSC, among others. For fast updates, you may visit NAPOLCOM official website or follow us at our social media pages via Facebook and Twitter.